This is the second review of The Lake District Dairy Co.’s new Quark based cooking sauces. This next review is for the Tikka cooking sauce. It’s described as ‘one of the nation’s favourties – a beautiful bend of herbs and spices for perfect curry dishes with minimal fuss’. 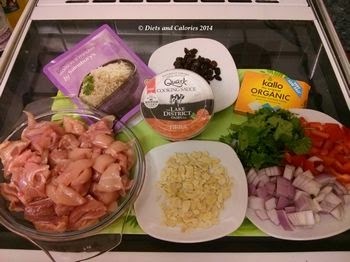 I was provided (courtesy of The Lake District Dairy Co.) with a recipe and all the ingredients necessary to make Chicken Tikka & Quark Rice. 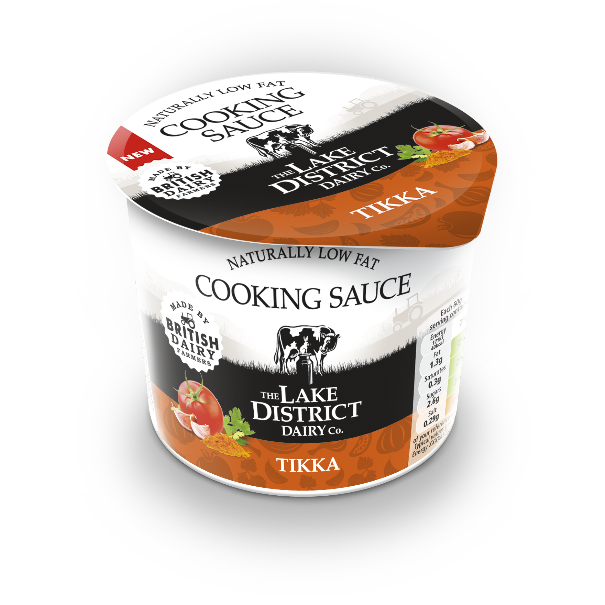 As mentioned in my earlier post (HERE), The Lake District Dairy Co. have recently introduced three quark-based cooking sauces. Varieties include: Garlic & Herb, Tikka and Tomato & Basil. Because they are made from Quark, they are naturally much lower in fat and saturated fat than other cream cheese based cooking sauces. 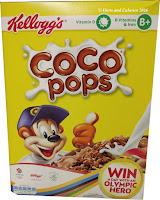 They’re also a good source of protein and suitable for vegetarians. Quark is also great news for dieters as it is virtually the lowest calorie cream cheese available. The recipe is described as an easy to make alternative and healthy take on the traditional chicken tikka masala. 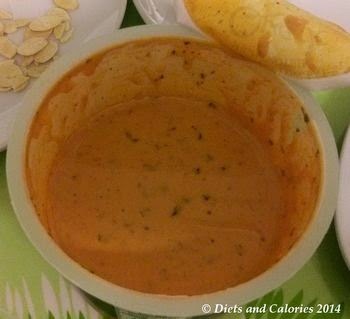 This recipe serves 4 and has 382 calories per serving. 1 tbsp vegetable oil (I used coconut oil half tbsp). 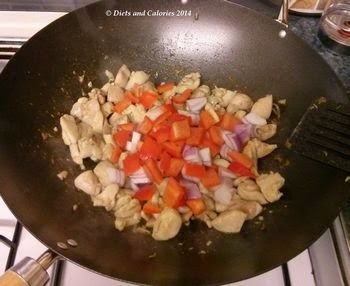 Heat the oil in a large wok or frying pan, then add chicken and stir fry on high heat until starts to brown. Add cumin, onion and red pepper and keep frying until soft. Stir in rice and stock, bring to boil, cover and simmer for 10 minutes. 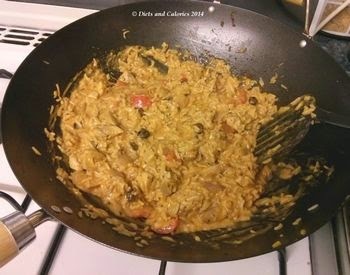 Remove lid, stir in Tikka cooking sauce and raisins. Simmer another 5 minutes. 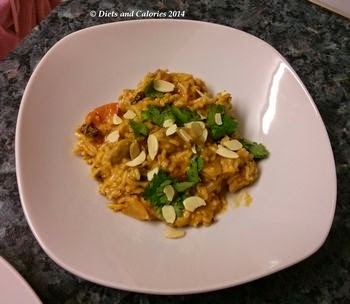 Scatter over coriander and toasted almonds to serve. Once again, this was extremely easy to make. The prep time took a bit longer than yesterday’s Gnocchi and Spinach tomato & basil quark recipe, as I had to cut up the chicken and remove as much fat as I could see. Also, I’d been sent a packet of basmati rice, the kind which you just heat for 2 minutes in the microwave rather than add water to and boil. So this meant straying from the recipe a bit. I added the rice straight to the wok and added about 100ml of chicken stock instead of the 250ml in the recipe. This dish is more like an alternative to a Biryani though I probably ended up with a creamier dish than was intended. The great news was everyone loved it. I served it with some broccoli, cauliflower, green beans and carrots (I always cook at least 4 types of veg)! The sauce is absolutely gorgeous. I love the way it can be used in so many ways, even tasted straight out of the pot. 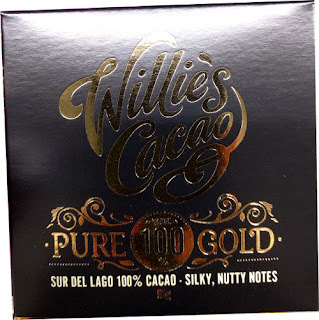 The flavours are just right. They’re not overpowering which can be off putting for younger children and my youngest was more than happy to finish this meal up. You can find the Lake District Dairy Co. cooking sauces in the chilled cabinet sections (where the quark and cream cheeses are) in supermarkets. 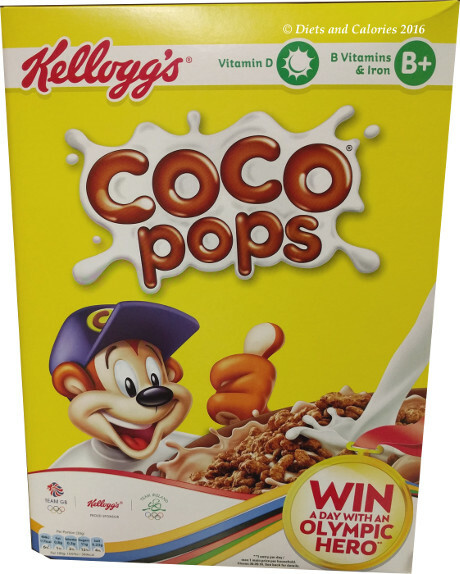 Nutrition information per 100ml: 75 calories, 6g protein, 7.5g carbs, 4.6g sugars, 0.6g saturates, 0.74g salt.